A WHEELCHAIR basketball workshop will test young players who take to the court at the Hainsworth Centre next Friday. Perth Wheelcat and City of Wanneroo youth volunteer Kim Robins (27) developed the competition. Robins, who has played the sport in Italy, Spain and Germany, said he hoped the program would be an eye-opener for those who get involved. He said they hoped to attract about 120 youths to the event from 3.30pm to 6pm. “Basketball is a very popular sport for young people in Girrawheen and many of them are excellent players… on their feet,” he said. He said, they would become reliant on their upper body skills and their wheelchair to get around the court. “Everyone really enjoys it and it’s also really inclusive because you might be really athletic but you’re put on an equal playing field with the person that’s maybe not as athletic,” Robins said. Robins played a range of sports before getting serious about basketball when he was about 17. “When I was 21 after I’d been to a World Championships for the under-23s in the Australian team I played in Italy,” he said. He said workshops like this gave youth an opportunity to try omething new and also exposed them to disability. “Even the first couple of weeks I was here everyone was kind of a bit cautious talking to me because I was new and in a wheelchair and they’ve probably never seen that, but now I come in and everyone says hello and all the kids are really good like that,” he said. Youth support worker Ossie Bravo said they held a number of weekly activities at the drop-in centre. “It’s growing because it’s a good program,” he said. He said they had young people attend from Mirrabooka, Girrawheen, Balga and Koondoola as well as some from Warwick and Greenwood. 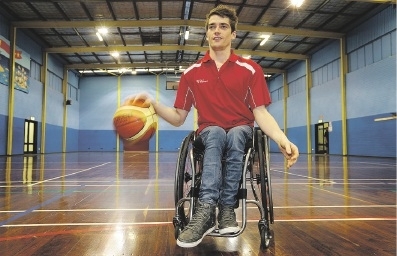 “I can’t wait to have young people experience what it’s like to play sport in a wheelchair,” he said. To find out more about the wheelchair basketball workshop and the City’s other youth programs, visit wanneroo.wa.gov.au or follow the City’s youth team on Facebook.